When a character with immense power makes a crater with it. The ability to "crater" something may be achieved by whacking it with some variety of Super Strength power, or unleashing some kind of pressure shockwave that does the same. On some occasions though, a character may invoke this trope by using someone else as a medium. A common variant is for a character with super jumping powers is to land and form a crater on impact, demonstrating the character's Nigh-Invulnerability. Sometimes happens when attempting a Three-Point Landing. Compare/contrast: Ground-Shattering Landing, Ground Pound, Shockwave Stomp, and Impact Silhouette. See also Chunky Updraft. Very common during battles in Dragon Ball Z. Pain makes one by flattening all of Konoha. After the time skip, Sakura does this all the time. Tsunade, whose also Sakura's teacher is capable of doing this with one finger. A crater is formed every single time Neji uses the Eight Trigrams Palm Rotation. This happens when Team 7 is inside Orochimaru's hideout. Naruto's Rasen-Shuriken technique eventually gains this power. In a tournament fight Jack Rakan delivers a punch that makes a huge fist-shaped crater in the sand. Ku Fei and Negi create a crater while arm wrestling. It happens often in AKIRA. Lots of examples in YuYu Hakusho, once you get to the B-class and higher characters. Sensui (in Holy Energy mode) even lampshades it. Yasutora Sado/Chad from Bleach has La Muerte, a huge punch that makes a skull-shaped crater into the wall or ground behind the enemy. Lina Inverse from Slayers leaves a crater each time she casts her signature spell. InuYasha takes this Up to Eleven with the Wind Scar, an attack that ploughs four massive claw-like furrows into the ground with the force of his swing. He also does this with fairly standard punches. Envy from Fullmetal Alchemist does this while throwing a fit after hearing that his father Hohenheim is dead, since he wanted to kill him himself. Milky Rose pulls this off in Pretty Cure All Stars DX by punching the ground under Big Bad Fusion. Happens a lot in One-Punch Man, with Saitama cratering the terrain behind anything he punches, if it's not outright obliterated that is. 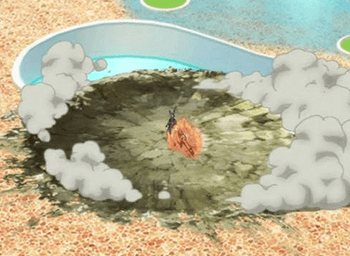 In Brave10, when Isanami uses her Power of the Void, she is left standing in a shallow crater. In Supergirl story Red Daughter of Krypton, a Supergirl enemy creates a new moon crater by smashing the titular heroine into the Moon. And in Bizarrogirl, Supergirl punches her Bizarro twin so hard Bizarrogirl makes a crater when she lands. In Superman story Kryptonite Nevermore, Superman makes one when he lands next to Lois Lane. Scott Pilgrim introduces Todd Ingram, who makes two craters on the moon for his girlfriends. Incredible Hulk in general, when he lands after one of his quarter-mile leaps. In Buffy the Vampire Slayer/Supergirl fanfic The Vampire of Steel, Supergirl makes a crater when she body-slams Zol-Am into the ground. In Thor, this is how Thor likes to land. The Matrix Revolutions has Smith make a crater in the final fight with Neo. In the Made-for-TV Movie The Death of The Incredible Hulk, Hulk turns into Banner during a fall out of an airplane and lands, leaving a crater. Happens on occasion when teleporting in Jumper. This is how careless Flying Brick Hancock lands... em, crash-lands every time, except when he drops on something more expensive than the mere highways and pavements. Done a couple of times in Kung Fu Hustle, once by the Beast who pounds the protagonist's head into the ground repeatedly at the bottom of it, then by the protagonist with the Buddha Palm strike leaving a 20' across hand shaped crater. In Man of Steel, when Superman or any other Kryptonian jumps or lands they leave a crater in the ground. Animorphs: the comet that killed the dinosaurs is said to leave a crater you could lose a dozen cities in. In The Wheel of Time, the cleansing of sai'din, the greatest working of the One Power since the Age of Legends, annihilates the tainted city of Shadar Logoth with a miles-wide Sphere of Destruction that leaves a perfectly hemispherical crater behind. Characters unaware of what had transpired have a collective Oh, Crap! moment upon seeing the site. In No Ordinary Family, Jim tends to crater the roofs of buildings he lands on after his leaps. In Kamen Rider Den-O, Zeronos Vega Form makes a crater at the end of his first transformation simply by posing; contrast with Zeronos' Altair Form, which called down a bolt of lightning that split a nearby tree. Makoto makes one while rescuing Tsubaki (according to the dialogue, since we don't get to see it). Tager leaves one when using his Astral Heat. League of Legends: Jarvan's Cataclysm ability. DEMACIAAAAAAAA!!! Warcraft III: In Frozen Throne, Maiev can fight an Infernal that leaves a persistent crater on landing. While most ground-impact spells show the ground being damaged by the spell (which fades away after a while), this is the only instance where the terrain actually buckles up and down. The third Exmortis game opens with this, with Hannay having just escaped from the spirit world and caused a crater-inducing explosion on returning to reality. The first puzzle of the game involves climbing out of the crater. After the opening dungeon of Baldur's Gate II we get to see the aftermath of a battle between Irenicus and the Shadow Thieves: Part of Waukeen's Promenade has collapsed, and it's hinted the damage would have been worse if the Cowled Wizards hadn't arrived to stop the battle. In Baldurs Gate Siege Of Dragon Spear, Irenicus encountered some elven spellblades that tried to slay him. Again we just see the aftermath, a large smoking crater with dead bodies everywhere. In the Whateley Universe the supervillain Crater uses gravity control to do this to Tennyo. Ron does it in Kim Possible when he's doing his Mystical Monkey power thing. Regular Show: In the episode "Death Punchies," Rigby repeatedly punches Mordechai, digging a crater into the Earth so far that lava almost kills them. In the Steven Universe episode "Change Your Mind", when White Diamond demands to know where Pink Diamond is, Steven's separated gem half responds by shouting "she's gone" so loud that it creates a crater beneath his feet, illustrating just how ridiculously powerful he (and by extension, Steven himself) really is.